Best Family Tent Reviews: What Should I Choose For My Family? / Best Family Tent Reviews: What Should I Choose For My Family? 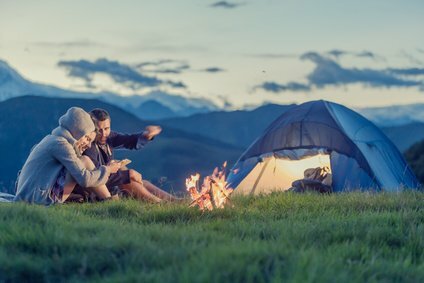 It’ll soon be time to start thinking about your next holiday but, rather than going abroad, why not go camping? The best family tent will give you plenty of room to sleep and live in, while giving you the freedom to visit lots of different places. The designs that are available these days allow you to holiday in the countryside in as much comfort as you would elsewhere, but with so many tents available on the market it can be tricky to find the one that will suit your needs. In this article we will be looking at various family tent reviews to help you choose the best one for you. Tent designs have improved dramatically in recent years. No longer will you spend ages trying to figure out which poles go where. Instead they are simple to put up, come with a range of features, and let you focus on having a great holiday without worrying about where you’re going to sleep. There are a number of things to consider before you purchase a family tent though, mainly relating to how many people you need it to accommodate, and what activities you want to be doing. What is a Family Tent? Family Camping tents are the largest type of tent that you can buy and are designed with a much larger capacity than individual ones. Typically they can sleep up to eight people, provide communal areas, have a porch to provide more sheltered space, and some models even have an electrical port access to facilitate the use of technology inside. Large family tents will offer plenty of space for your whole family and all of the equipment that you take with you, but there are some trade offs you need to think about to ensure you choose the right one for your needs. The first thing you must decide is how big a tent you actually need. 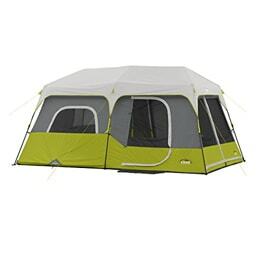 Of course you need enough space for everyone that is going on the trip with you, but it can be counter productive to get a tent that is too large. The larger the tent is, the more space it’s going to take up when transporting it. It will also be heavier, and can take longer to setup in the first place. There are also limits at some campsites of how big a space you can take up, so you must also take this into consideration. This needs to be considered when considering big camping tents. Other than that, simply make sure you are buying a product that can accommodate all of the people that you will be taking on your camping trip as well as all of their belongings and equipment that they will be bringing. You should also ensure that when the tent is packed away that there will be enough room in your car to carry it. The various different tents that are available come with different layouts. An 8 person tent, for example, will come with separate rooms and the ability to customize them. 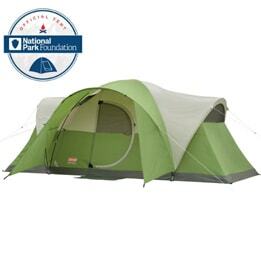 More rooms means more space, and can be a better guide of how many people the tent can comfortably accommodate. Manufacturers have to follow certain regulations when they say how many people a tent is suitable for, and while the tent will provide enough room for all of them, it may be a bit cramped. The kids will probably want their own room in the tent for their holiday, but there are some things to consider to make sure different sleeping times and requirements are looked after. If you have young children, for example, it is worth looking at getting a tent where a second room is right next to the main room, with a divider between the two that you can unzip. This is helpful because it means you will be able to put them to bed at whatever time you decide, without the risk of disturbing them later when you want to go to sleep. An easily opened divider is also essential because it means you will be able to quickly get to them in the night if they need reassurance, and you won’t necessarily even have to get out of your sleeping bag to do so. Technology these days allows for tent designs that are incredibly easy to put up. It is completely feasible to get a large tent that can be put in place within a number of minutes, but you may lose some sturdiness by opting for one of these. It’s crucial that you know how much/little skill will be involved with pitching your tent, and that you buy a product that is well within your comfort zone so you don’t get stuck trying to put it up in a rush. Before you buy a new tent you should take a look at how the entrance works. While some designs may be wide and open and seem great when there is sunny weather, they may not be so great when it’s windy and rainy. It’s worth thinking about the products that include rain shelters or some form of grooves to help channel water, and windproof features so you don’t get yourself tangled up in a storm. There are lots of extra features that can be included with family tents, and depending on where you plan on going these options could prove to be invaluable. Examples include an opening for an electrical cord, which is far more preferable than simply running it in through the entrance, hooks for lamps, “no trip” entrances and pockets for storage. These are features that the best family tent should boast. 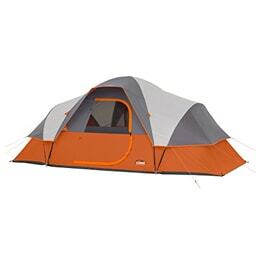 This large tent from Klondike is ideal for family trips. The main dome provides 98 square feet of space that can sleep up to five people, and the screen room provides a further 60 square feet of space that can sleep another three people. The zip-up walls are really useful for giving extra privacy, but ease of access should the need arise. The screen room is also usable as a sun shelter, somewhere to store all of your gear, or simply an extra space to relax in. With 6.5 feet of headroom in the main dome, you won’t feel cramped at all, and even have enough room to stand up. Airflow is ensured within the tent by the use of a full mesh roof and two mesh windows, while preventing bugs from getting inside. The materials that are used in its construction have been chosen to protect you from the weather. It is fully water resistant, and withstands tough breezes. All of the threads, zippers and webbing also have waterproof coatings to prevent them from being a weak link. This tent from CORE has been designed to provide a huge amount of space within the one room. The 16x9 foot floor means you can fit three queen air mattresses in here, and with 6ft of headroom you won’t feel confined at all. Focus has been put on making this tent as practical as possible too. The electrical cord access port gives you a way to provide power to your equipment inside without having to leave any parts of the tent open, and the inclusion of a small gear loft and side pockets allow you to store everything inside within reach. CORE have used their proprietary technology to block water from entering by combining water repellant fabrics with active bead technology, sealed seams and resistant seals around the door and windows. Ventilation is provided by the mesh ceiling and an adjustable air intake vent on the ground, and zippered panels are built into the doors to add some privacy. With the purchase of this tent you will get a carry bag, tent stakes, poles and a rain fly, and the setup process is well explained and easy to do. You’ll be ready to go camping as soon as it arrives! If you’re looking for a spacious tent that would be ideal for large groups on long trips, then this one from Coleman is well worth considering. It has a cabin design, with tall vertical walls that provide a center height of 6 feet and 2 inches. It will only take about fifteen minutes to set this tent up, with the whole process being made easy by the color coded poles, the snag free, continuous pole sleeves, and the Insta-Clip pole attachments that mean it will stay standing even during strong winds. The WeatherTec system uses welded floors and inverted seams to ensure that water is kept out, and the ingeniously designed windows mean that they can be left open without the worry of rainwater getting in. The rainfly is detachable, and the mesh roof ensures that ventilation is maintained. I particularly like the hinged door mechanism that makes it easy to enter and exit the tent, and the inclusion of the electrical access port allows you to use technology inside without having to leave an opening in the main door. If the thought of spending a while setting up your tent is a complete turnoff to you, then this one from CORE could well be the answer. It provides you with all the space you will need for a family trip, with the added benefit that there’s virtually no setup time at all. Once you arrive at the campground your tent will be up in seconds, leaving you to focus on having a great holiday. There are other easy to assemble instant tents to consider. 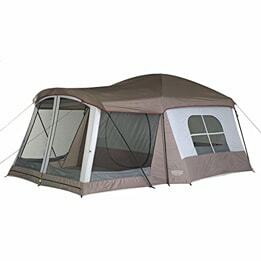 This is achieved by constructing the tent with a pre-assembled frame. All you need to do is unpack it, unfold the material and extend the poles. It’s just as easy to pack it away again. Inside the tent you get a 14x9 feet floor that is enough room to sleep up to nine people, or to place 2 queen sized air mattresses. There’s lots of headroom too, with a ceiling height of 6 feet and 6 inches so you won’t have to crouch as you move about. The tent also comes with a room divider to allow you to have separate compartments for privacy. The electrical cord access port is a really useful feature to enable you to power your devices without having a cable running through the main entrance. If you have a smaller family and don’t want to be spending a lot on a much larger tent than you need, then this option from Forfar could be a good choice for you. There is plenty of space within the tent to comfortably accommodate three people, and it won’t take up too much room on the campsite. You can also consider a ﻿﻿tent that sleeps 4 ﻿persons for your smaller family. By using high strength glass fiber rods, the structure of the tent is very sturdy and can withstand strong winds and tricky weather. It is fully waterproof, with a double layered design, so rain won’t be able to seep in. It has also been designed to encourage a constant airflow by placing dual vents in the roof, door and side walls alongside four sealable mesh panels. Purchase of the tent also includes all of the poles and nails that you need to set it up, and it even comes with a doormat. As it is a smaller dome, it is really simple to construct with you simply needing to feed two poles through and secure it to the ground. Camping is great fun, and can be a cost effective way of taking the whole family on holiday. Tents are available in a wide range of shapes and sizes, with the best family tent provides lots of space inside, separate rooms for privacy, and plenty of storage space for all of your equipment.